CBNA science students prepare the payload for their recent successful balloon launch. The Coe-Brown Northwood Academy Science Club, working in conjunction with the University of New Hampshire Project SMART summer program, the Project SMART outreach program (CBNA, Londonderry High School and Timberlane High School) and Dr. Tony Phillips’ Earth to Sky Calculus program based in California had successful balloon launches on Saturday, November 23, 2015. The East Coast Project Smart and the Earth to Sky Calculus program have developed a cooperative venture to launch balloons simultaneously from the West and East coasts carrying payloads to measure difference in the radiation levels at the edge of the atmosphere between East and West. 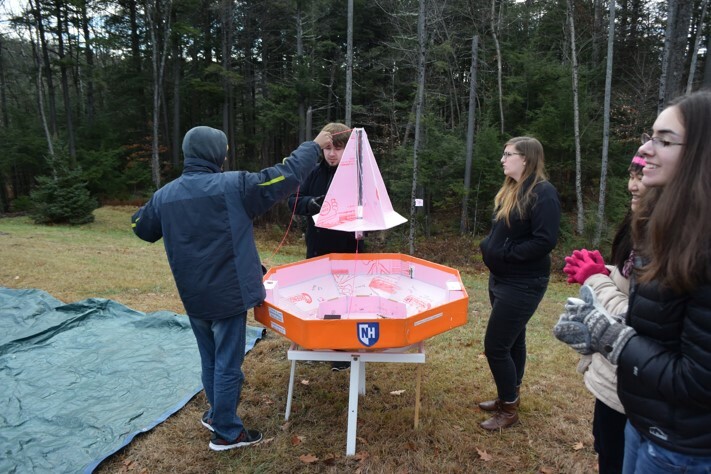 East Coast students and their advisors launched two balloons near New London, NH starting with the first release at 10:37 am on Saturday, November 23. The flights lasted about two hours reaching 102,000 feet – the edge of space. CBNA’s team recovered the California team’s payload near Steep Falls, Maine on Saturday afternoon. CBNA also recovered its payload near Freeport, Maine on the afternoon of Sunday, November 24, caught high in a tree, making recovery difficult. The chase for recovery involved over 500 miles of driving throughout the weekend. This novel flight was commissioned by Dr. Peter Bloser from UNH for the purpose of flying a prototype scintillator that is being developed for use on spacecraft. The results from that part of mission are still being processed by the group from Londonderry High School. The CBNA team did an outstanding job on the flight line. The camera bay design, release mechanism, and flight vehicle were CBNA’s primary responsibility. This flight resulted in some of the highest quality images of the edge of space obtained yet by a CBNA mission. Congratulations to all of these talented student scientists.